June | 2014 | Hand Luggage. 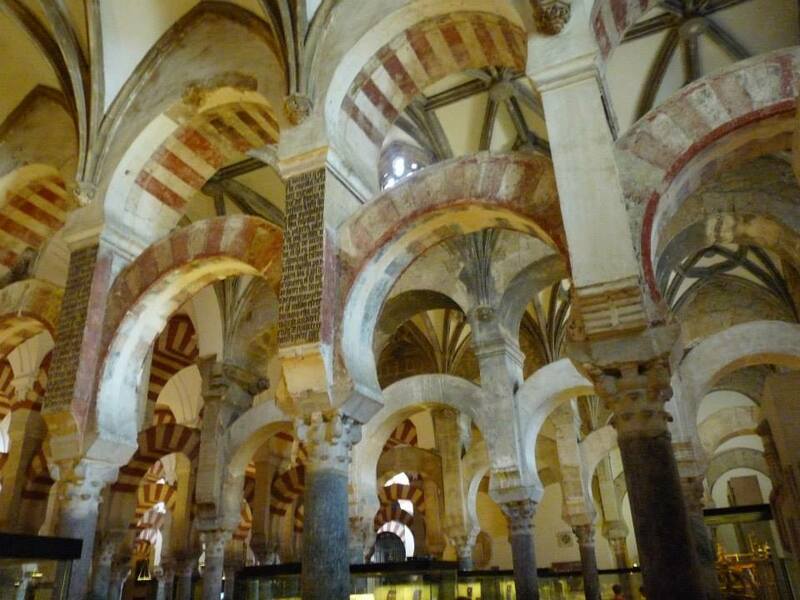 The mosque of Cordoba (Mezquita de Córdoba) or the Great Mosque of Córdoba is a medieval Islamic mosque that was converted into a Roman Catholic Cathedral. 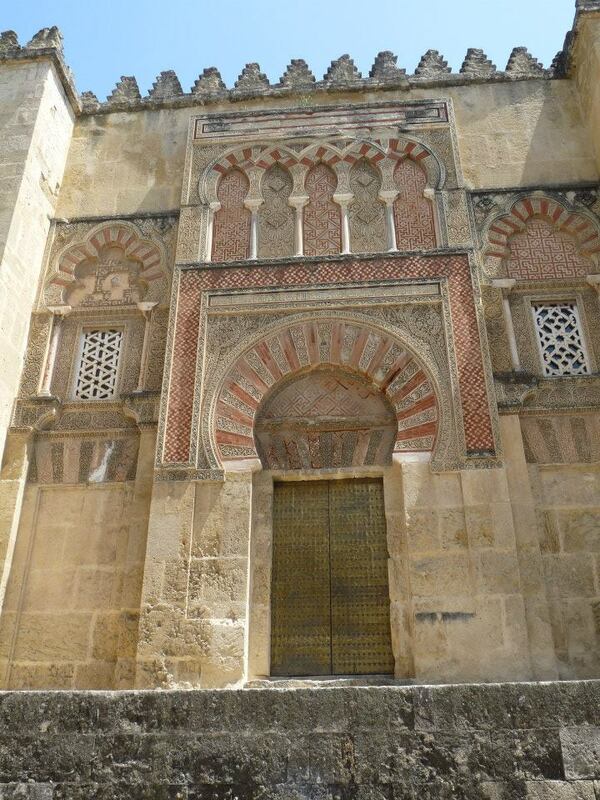 Within its imposing walls is a unique blend of Moorish and Christian religious styles, reflecting the altering fortunes of the city as it was conquered and re-conquered throughout the years. The building is most notable for its incredible prayer hall, with 856 columns of jasper, onyx, marble, and granite that stretch out as far as the eye can see. These were made from pieces of the Roman temple which had occupied the site previously, as well as other destroyed Roman buildings, such as the Mérida amphitheatre. 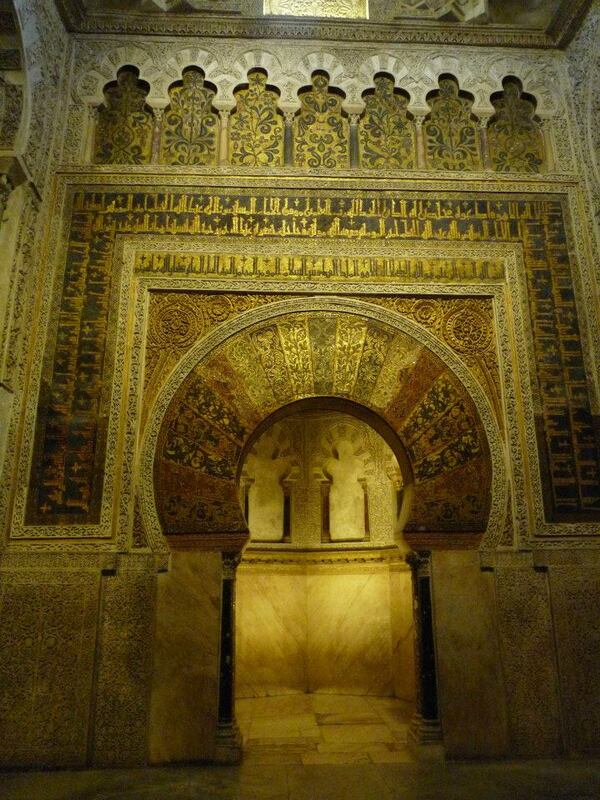 The focal point in the prayer hall is the famous horseshoe shaped, richly gilded prayer niche or mihrab. A mihrab is used in a mosque to identify the wall that faces Mecca—the birth place of Islam in what is now Saudi Arabia. 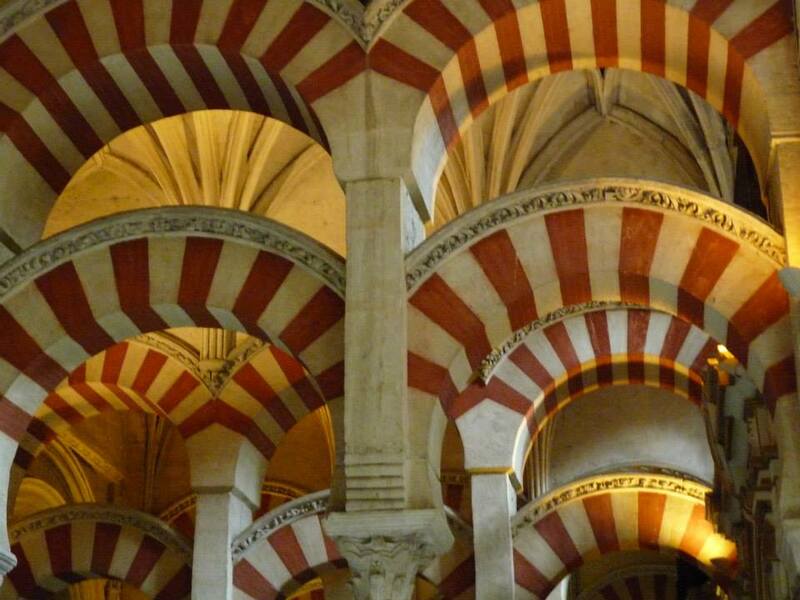 In 1236, Córdoba was conquered by King Ferdinand III of Castile in the ‘Reconquista’, and the mosque was converted into a Catholic church. 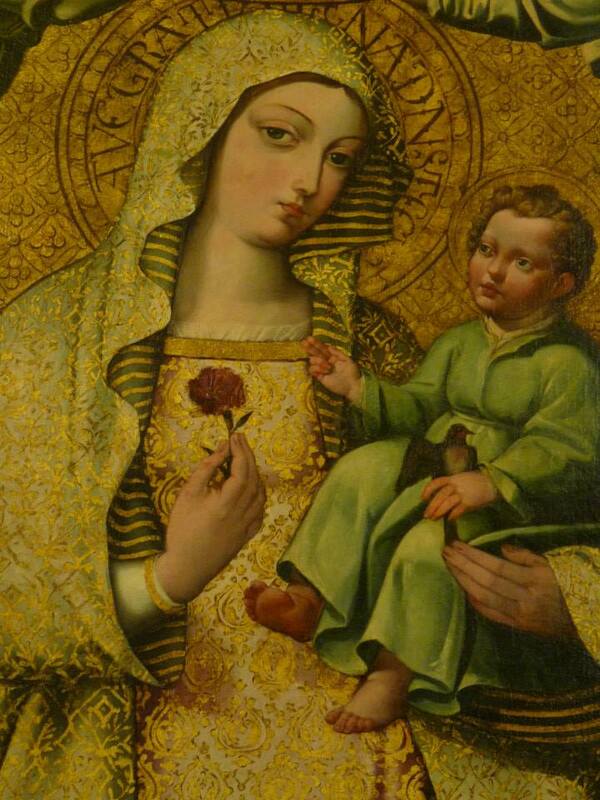 Whereas the Islamic mosque is characterised by its lack of imagery, the Catholic cathedral is sumptuously decorated with religious iconography, gilded paintings and cherubs singing to the skies. 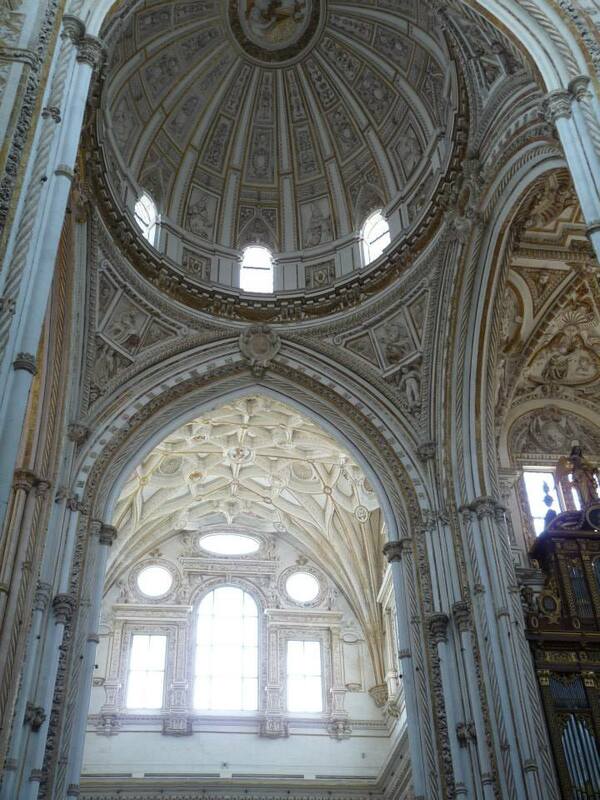 The most significant alteration was the building of a Renaissance cathedral nave right in the middle of the expansive structure. This airy white structure that seems to throw itself open to the heavens is in marked contrast to the darker, almost gloomy forest of columns that surround it. 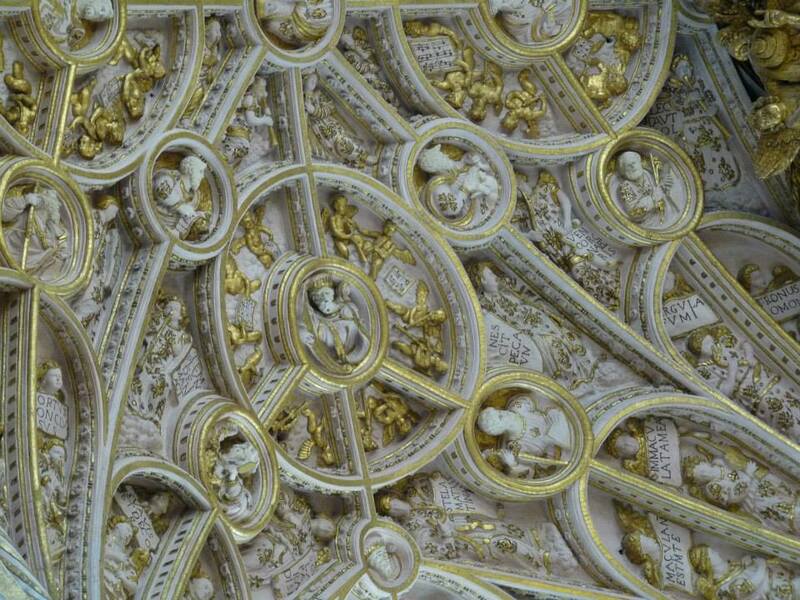 The kings who followed added further Christian features, such as King Henry II rebuilding the chapel in the 14th century. 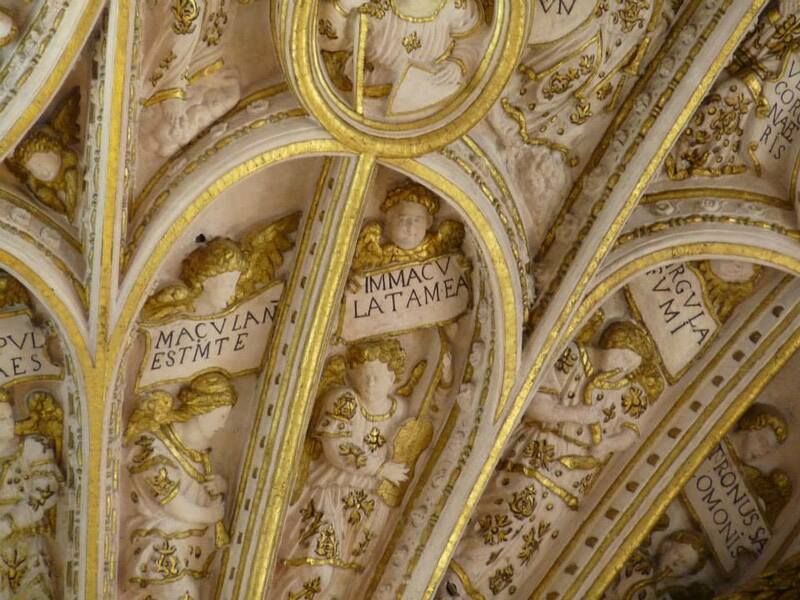 Here’s the ornate paint work on the Chapel of Sagrario’s roof. The minaret of the mosque was also converted to the bell tower of the cathedral. 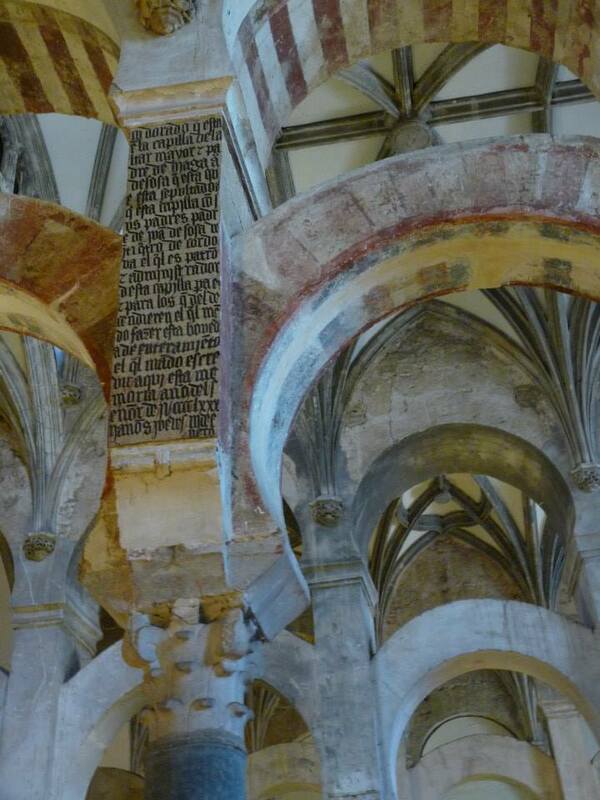 It was adorned with Santiago de Compostela’s captured cathedral bells. It is set in the Patio de Los Naranjo (courtyard of the orange trees) the beautiful courtyard at the entrance to the Mezquita. We decided to hire a car for a few days to explore further afield from Malaga and see what else Andalucia had to offer. First on the itinerary (in no small part due to Micheal Portillo!) 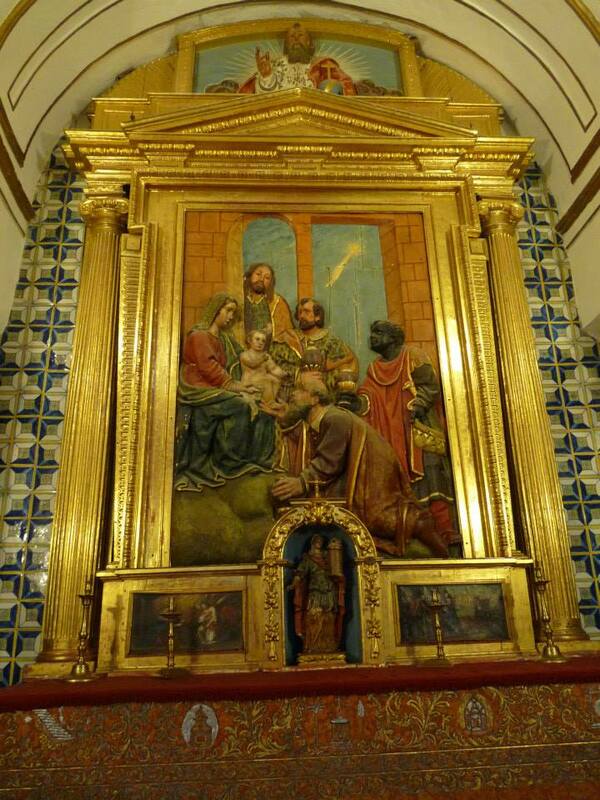 is Cordoba. 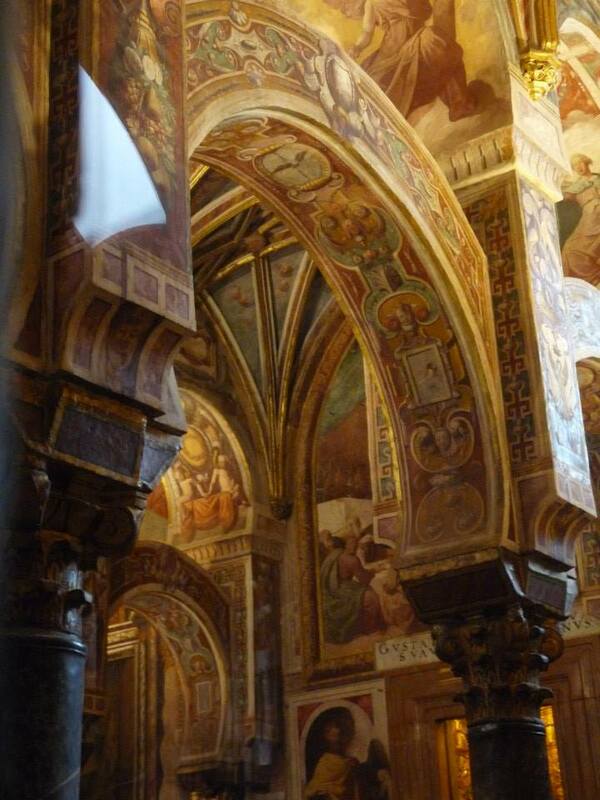 About a two hour drive from Malaga this incredible city has a myriad of history seeping from every pore. 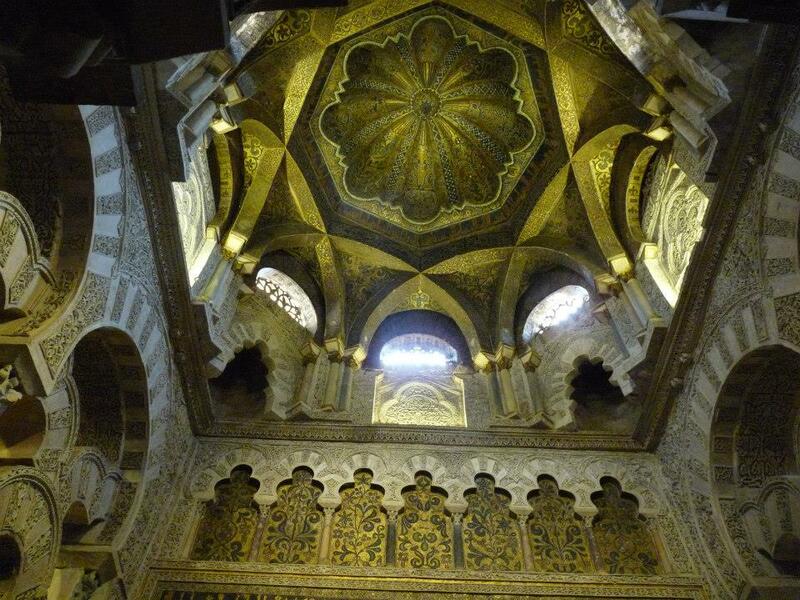 From Roman bridges to Moorish mosques and a breath taking cathedral. 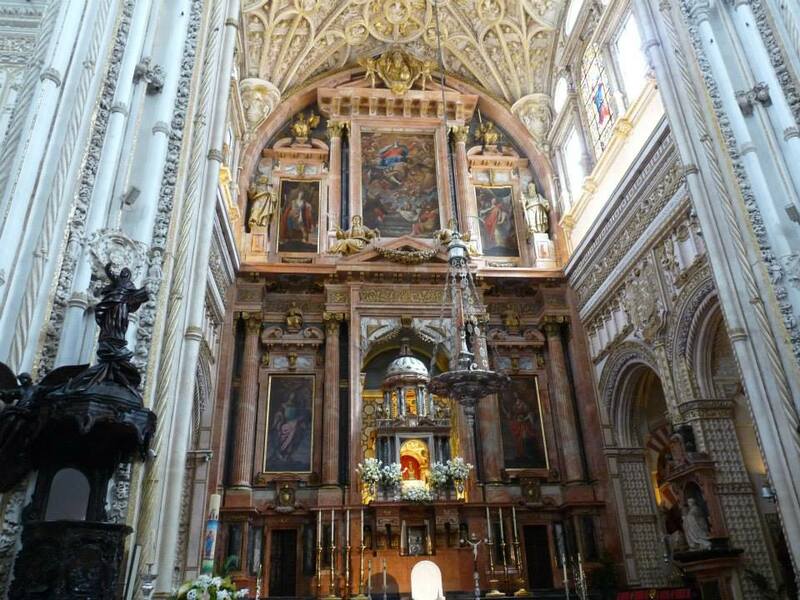 Cordoba has seen its fair share of history, being an Iberian and Roman city in ancient times and later the capital of an Islamic caliphate. 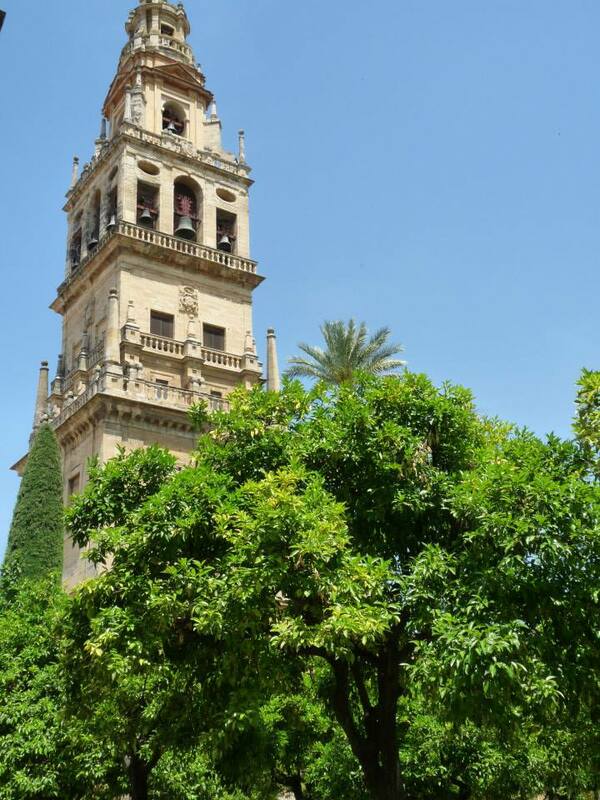 Surrounding the large old town are Roman walls with three of the original 13 gates remaining – Puerta de Almodóvar, the Puerta de Sevilla and Puerta del Puente. 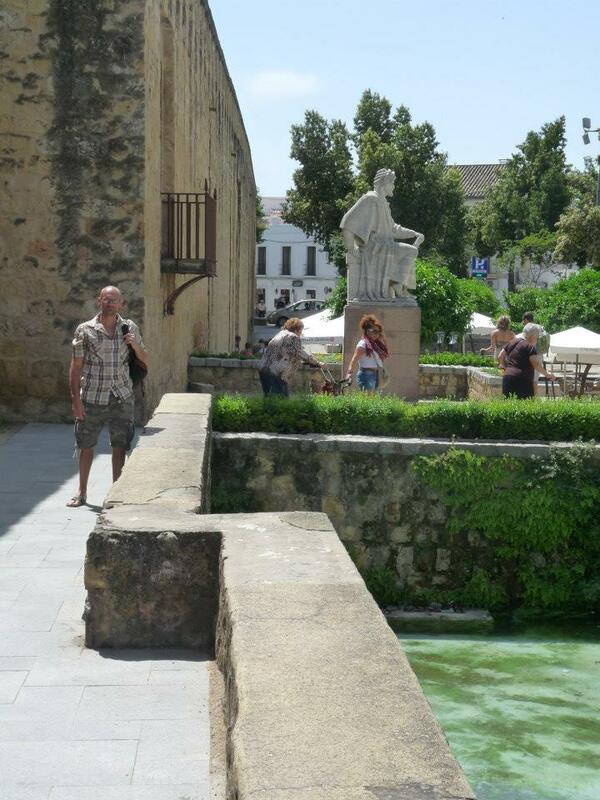 Here Neil loiters near the castle walls where a picturesque canal flows alongside the imposing sandy coloured ediface. 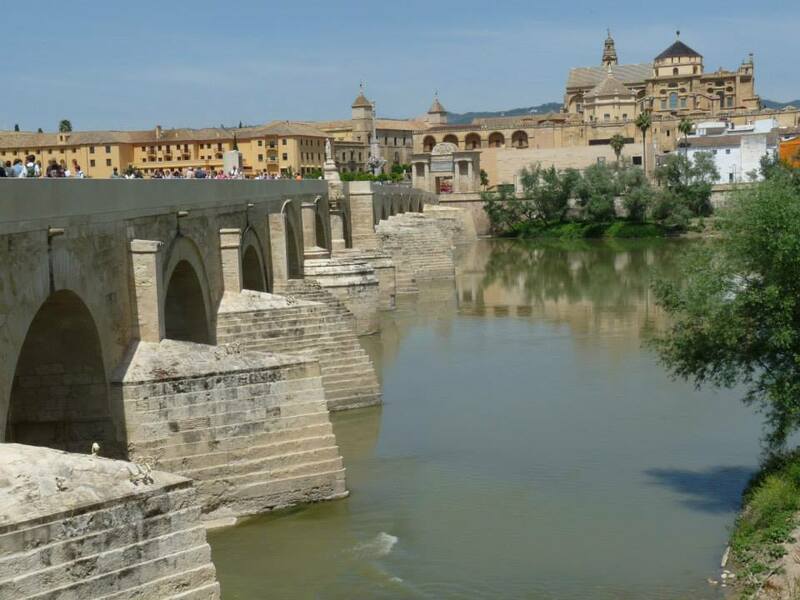 Next up we take a trot along the huge Roman bridge to view the impressive Puerta del Puente and city walls from a distance. 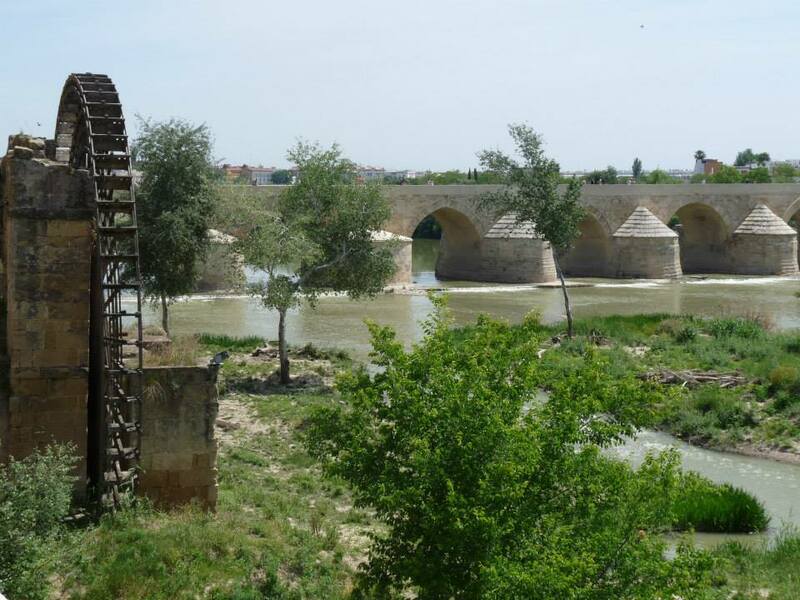 Alongside the bridge you can see the remains of Albolafia mill, one of the eleven Mills of Guadalquivir in Cordoba. Its reconstructed water wheel rears up from the river bed like a wooden monster has been roused. 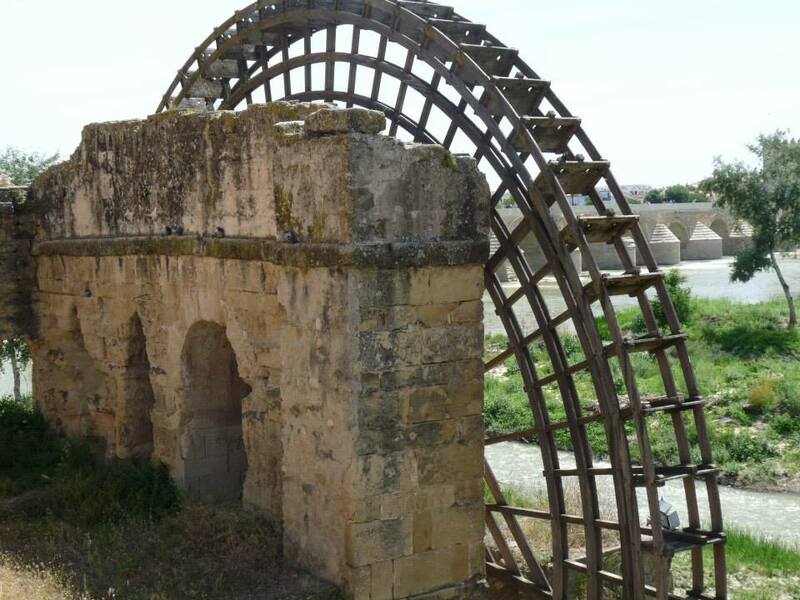 The original wheel was dismantled by order of Queen Isabel ‘La Católica’ who disliked the noise it produced so close to the Castle, the royal residence. 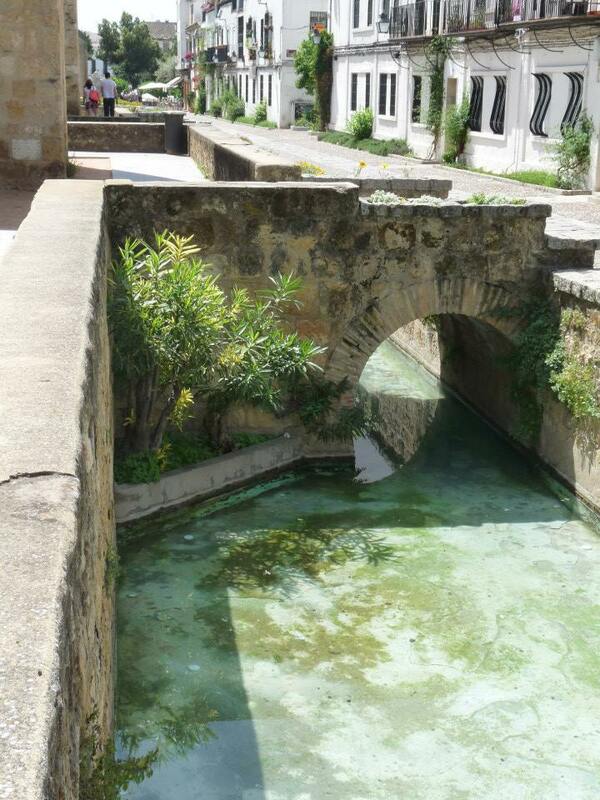 The bridge itself was the only bridge of the city for twenty centuries, until the construction of the San Rafael Bridge in the mid-20th century. 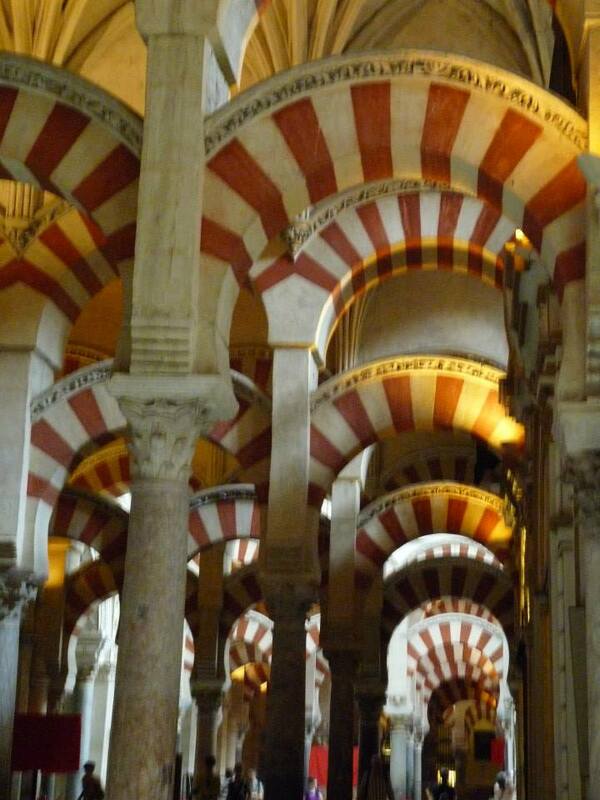 Built in the early 1st century BC it has a length of about 250 m and consists of 16 arches. 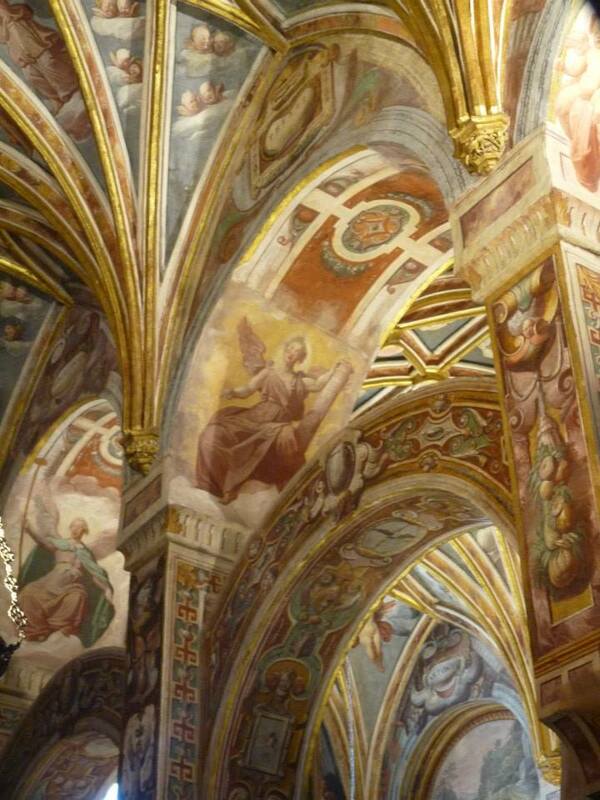 Next stop the awe inspiring Cathedral of Cordoba with its many incarnations and incredible interior. There comes a time in every holiday when the lure of the market becomes just too much to resist . 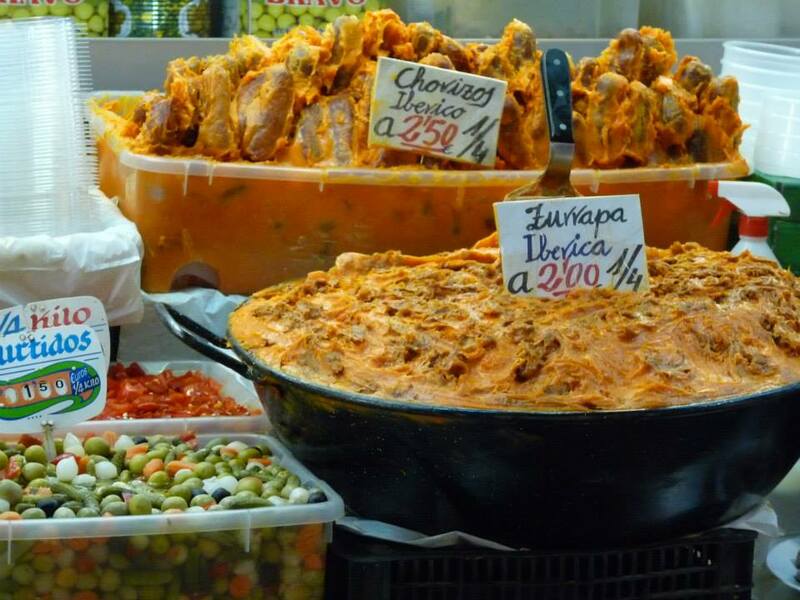 . . . .
Malaga was no exception and we had the distinction of being a two minute walk away from Malaga’s main fresh market – Atarazanas Market. There is a stunning stain glass window that depicts the city in glorious multi-colour, high above the rows of stalls, stacked with slippery fish, ridiculously large vegetables and vats of lardy meats. 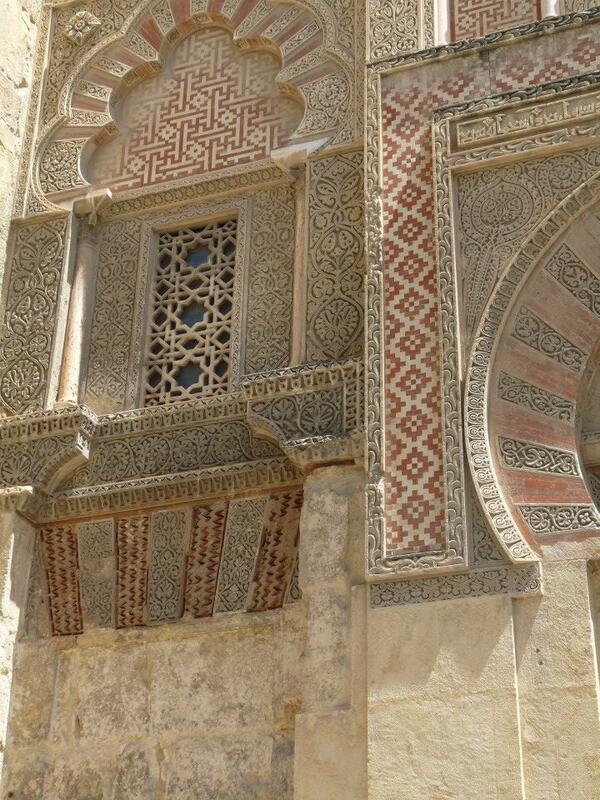 The market has beautiful Moorish architecture alongside the more contemporary 19th century building styles. The main entrance is a huge archway that is the only remaining part of what was once a seven-arched shipyard. 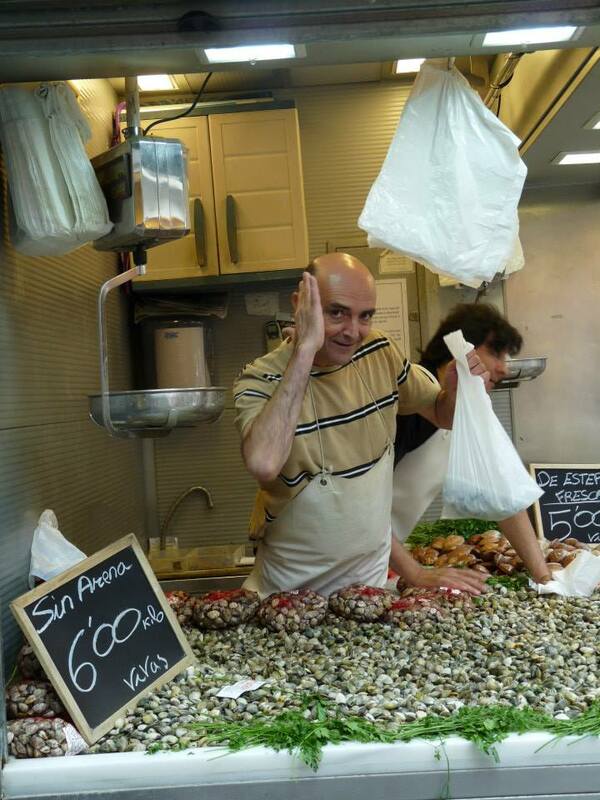 Apparently until the 18th century the sea reached right up to the present-day, middle of the city, land locked, market. Fishermen sat alongside the south-facing wall of the building and cast their lines into the waters. 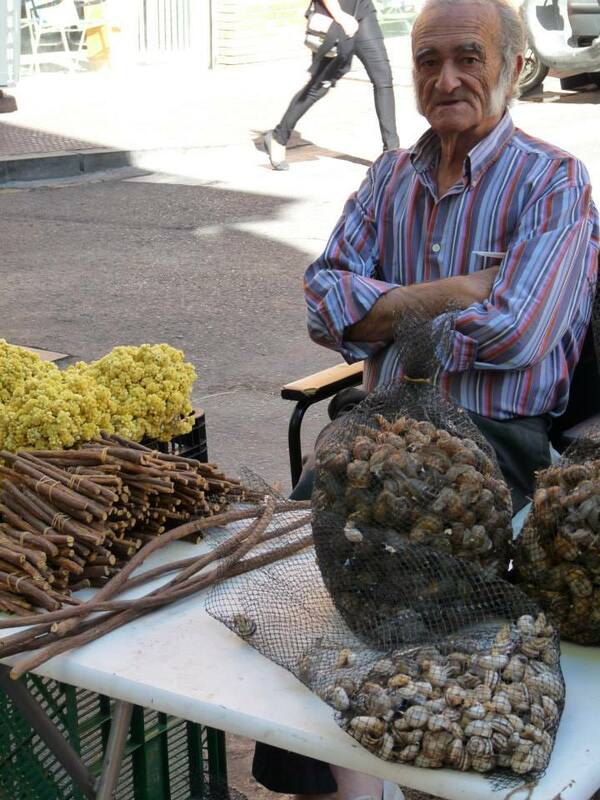 Here’s a couple of the characters you can find at the market, a charming poser and a rather stern looking snail seller! 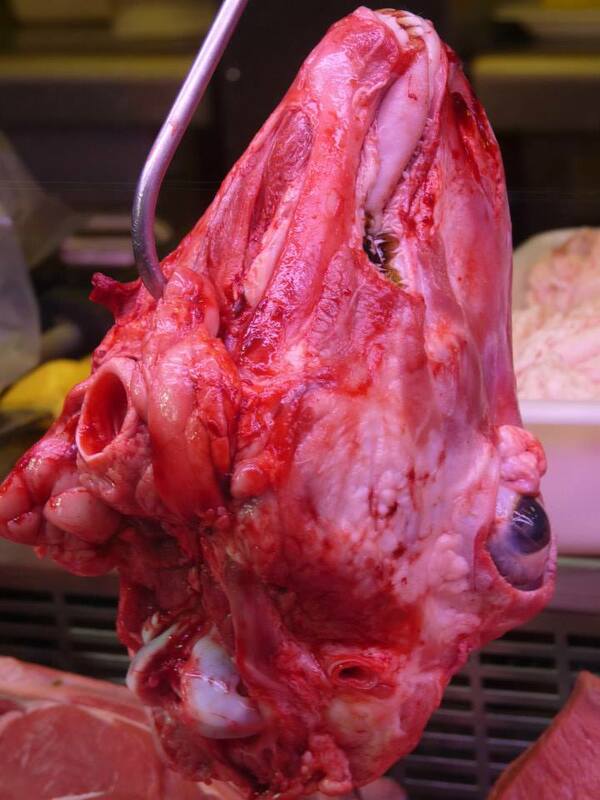 As a vegetarian, a visit to the very visceral reality of continental markets can sometimes be a bit stomach churning but the way that every single piece of an animal is used, from head and tongue, to liver, lungs and wind pipe, is a very good example of waste not want not. We seem very squeamish in the UK about utilising all of the fleshy bits available to the carnivore. Is it because the bits are actually identifiable that make people so adverse to scoffing them? A case in point – a sheep’s head complete with glassy eyes, still a delicacy on the continent, boiled until the meat falls off the bone. Decades ago people in the UK would think nothing of plating up liver, tripe, pigs trotters and other, now almost defunct, meaty mouthfuls. What happened? Why has a society that is still a meat eating majority, become so picky and so unwilling to be presented with the visual reality of the origins of their meal? Given the current climate of ever decreasing resources, increasing population and more and more pressure on food production, isn’t it time that meat eaters started to embrace and eat all the bits of the animal, not just the unidentifiable, easy to mentally and physically digest, parts?